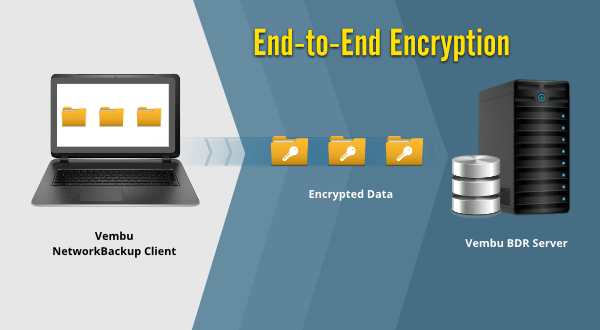 End-to-End Encryption (E2EE) is a system of communication between two sources or nodes that can not be read or interrupted or stolen by anyone else. For the businesses and IT environments, backup encryption is very much important to maintain their privacy. Encryption is the process of converting information or data into a code to prevent unauthorized access. Vembu offers built-in AES 256 bit Encryption algorithm for all type of backup plugins, giving you the utmost protection of your backup in flight and at rest. This securely protects your data from hackers, intruders, criminals and is a critical component of security. To ensures the security of your customer’s data, the backup data is compressed and encrypted during the transmission process, over the internet from the client to the Vembu BDR server. Vembu protects all your VM backups, Image level backups and Network backups with the latest AES 256 Encryption algorithm. Vembu BDR server stores the backup data in an encrypted form so that no one can see or access your original data. In this case, you can enable the Other Backup (all plugins backup) in the same Advanced Encryption Settings page.